This entry was posted on Sunday, August 5th, 2018 at 10:13 am and is filed under Drama. You can follow any responses to this entry through the RSS 2.0 feed. You can leave a response, or trackback from your own site. Wow! Looking at the trailer, this movie seems much older than even 1991…I don’t think it is the music, for me at least. Of course, I want to see it. After reading your review, I am intrigued by the various relationships. Thanks again for an insightful review. Katrina, you are exactly right! It does seem like it’s set earlier than 1991 and the music just confuses the matter. 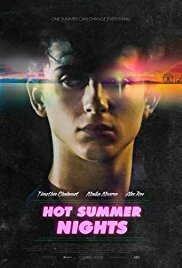 I do believe we are going to see a lot of movie work from Chalamet, Monroe and Cohen in the years to come.